CodeTwo Exchange Rules Pro gives you the possibility to set up conditions, exceptions and actions of your rules exactly the way you want it. The application offers you many functions to choose from. Owing to this, can be sure that the constant email flow in your company is well managed and controlled. The created rules determine, e.g. if the message should be rerouted, blocked, encoded, stamped with a signature or auto-replied. The range of CodeTwo Exchange Rules Pro features is quite extensive. 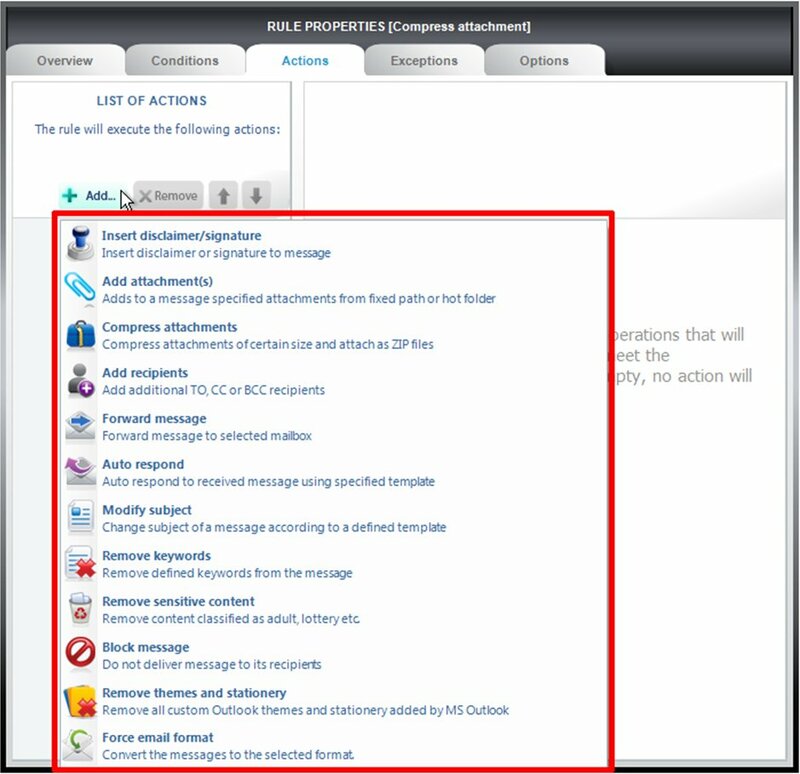 The picture below presents a list of available actions, while there is a similar number of conditions and exceptions accessible in this e-mail management program. Considering the fact that CodeTwo Exchange Rules Pro is so advanced, your rules structure may be quite complex too. That is why our developers included a few handy things to facilitate your work with the program. What is more, each rule can be quickly tested within the program. 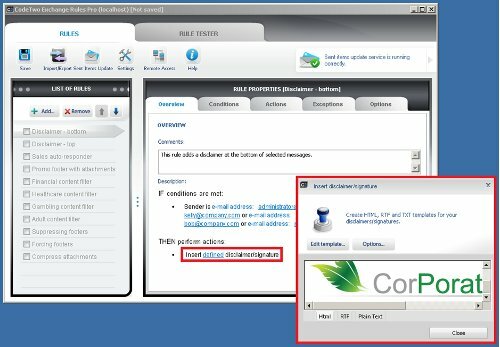 The Rule Tester resembles a real mail client, so it is very intuitive and easy to use. 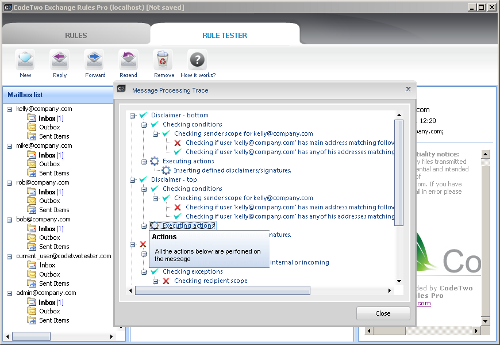 The tester’s module enables you to view the end-users’ messages which look exactly the way they appear for the recipient. Let’s assume you check a sent message in the dummy inbox to see if your actions have been successfully applied. In the Rule Tester you can see straight away e.g. 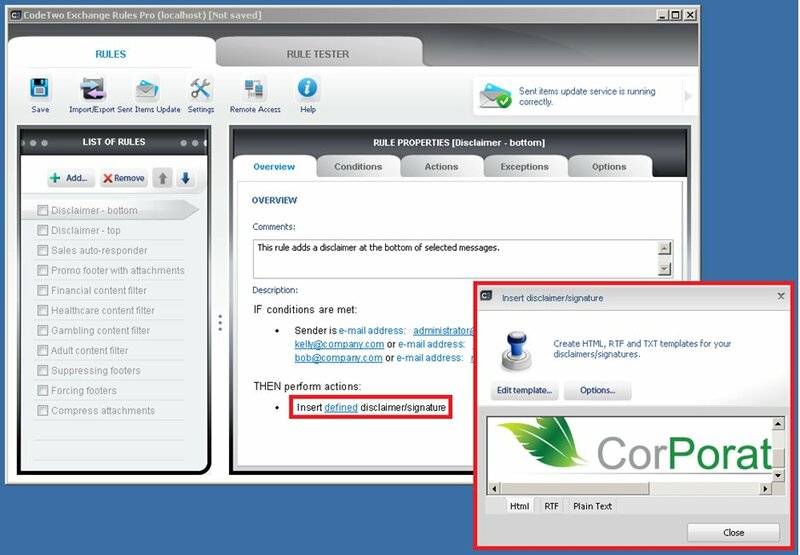 how your brand new e-mail signature has been added to the e-mail. You also may want to have a look at the Message Processing Trace (MPT) mechanism. It enables you to track all stages of your message transformation process. So when you have a lot of rules with a complicated structure of conditions and exceptions, MPT allows you to get a simplified preview of how they work in practice. The new window appears showing you the ‘path’ of the tested message. It looks like a tree of actions which were processed while sending the message. 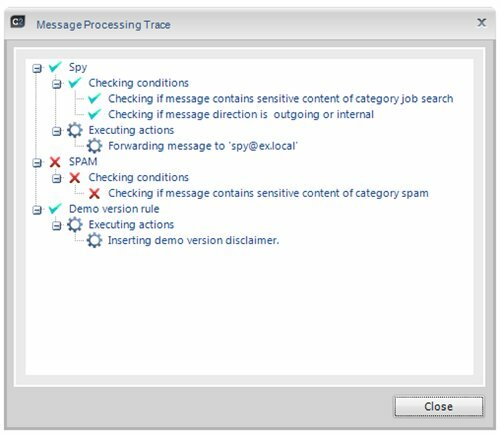 In fact, they illustrate rules defined in the program and inform of conditions that are met (green tick) and actions performed on this message (a grey sprocket). As it is easy to guess, the red crosses stand for the conditions that have not been met and for the unperformed actions. Take advantage of these tips to improve e-mail administration and address potential issues in the program. To find out more about CodeTwo Exchange Rules Pro main features watch our video tutorials. Feel free to post your comments or enquires regarding the program.